Wyoming County Chorale Members (first row, from left) Harrison Ingemarson, Ruth Tewksbury, Pat Keiber, Naomi Zack, Carly Dibble, (second row) Trudy Cook, David Little, Kathy Reposa, Lucy Keiber, Elaine Mackey, (third row) Tonya Boatman, Alicia Kirkpatrick, Gregory Jezewski, Sarah Shaffer-Greene, and Ann Noldy invite anyone in the area with an interest in singing to join them at 7 pm on Tuesday evenings in Father Nallin Hall at the Nativity BVM School building in Tunkhannock. The Wyoming County Chorale got its start in about 1992 and, as it grew, its members not only bonded but got to do some amazing things, like singing backup for the rock group Foreigner twice. There is abundant talent in Wyoming County, so it wasn’t surprising to long-time members that several of the Chorale’s founders moved on to loftier ventures. Carl Shinko, who served as director for 15 years, started an audiovisual production company, which led to him producing albums for national and international recording stars. Long time accompanist Ron Stabinsky has enjoyed opportunities to perform and record with jazz, classical and alternative artists around the world. Maggie Cartwright was also credited for forming the ensemble. 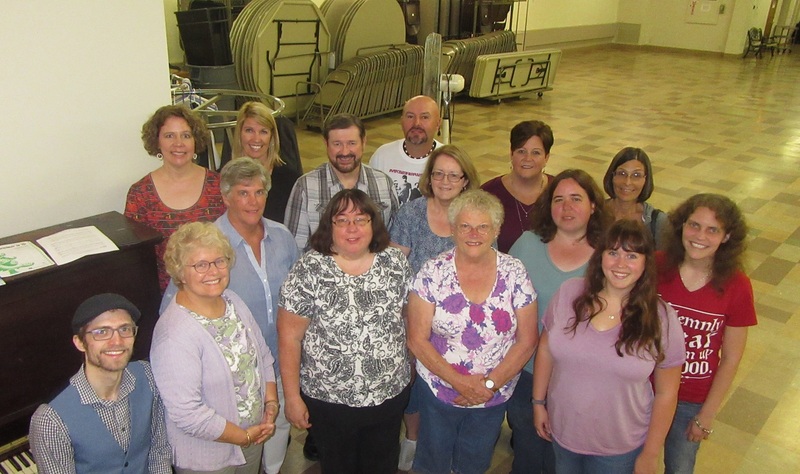 After a routine summer vacation, the Wyoming County Chorale met for rehearsal on Tuesday evening at Father Nallin Hall in Tunkhannock to start rehearsing for their annual Christmas show, one of two primary performances the group coordinates every year. Fifteen people were ready for the first 7 pm practice. As the Chorale was once 30 to 40 voices strong, there is plenty of room for new members. Returning members cited numerous reasons for originally joining the group, though it seems it was the common experiences and feelings about singing together that keeps bringing them back. “I was retired and finally had time,” offered eight-year member Trudy Cook. “I just wanted to get out of my house and meet new people,” remembers Elaine Mackey of Lathrop Township. As a person living with multiple sclerosis, she adds, singing tends to buoy her as opposed to other group activities that could wear her out. That and some encouragement from her sister and the Chorale’s new director is all Alicia Kirkpatrick needed to attend her first rehearsal with the group. She recently moved back to Wyalusing from North Carolina and was seeing the sense of community that choral groups provide. “I’m from a musical family,” she remarked, “Music is expression.” Teaching also runs in her family. Her sister Tonya Boatman, who teaches chorus and music at Elk Lake, added that there is scientific evidence that music helps fight depression and is good for the mind and soul. Boatman suffered a stroke two years ago, and her doctors told her that music saved her brain. And then there are the more obvious benefits. “Music takes you places. It has brought me all sorts of opportunities,” said David Little, who joined the Chorale 12 years ago and serves as the vice president of the five member board. In addition to the ensemble’s gig with Foreigner, Little has sung with bluegrass star Ricky Scaggs and performed in a Star Wars show. Better yet, he and Cook have sung together at Carnegie Hall five times. Members Gregory Jezewski and Lucy Keiper simply love to sing and agreed that the opportunities for adults to continue with musical interests are limited. “This is an outlet for adults who want to sing and have fun,” Dibble stated. The Chorale is a non-profit organization supported by grants, donations and fundraising. There are no auditions, and people of all singing abilities are encouraged to join. Naomi Zack of Lemon Township admits that she didn’t believe that she had much of a singing voice when she joined the Chorale in 1994, but her confidence grew as did her friendships with other members, who pay only for their sheet music. Only Boatman and pianist Harrison Ingemarson receive a stipend for their work with the group. Ingemarson has been loosely involved with the Chorale since his mother brought him to rehearsals as a teen. The concert is planned for Saturday, Dec. 8. The venue will depend on how much the Chorale grows between now and then. “If we have a lot of people, we’ll look for a larger place. If we are a smaller group, we’ll find some place more intimate,” Dibble explained. “There’s still plenty of time to learn the songs,” added Boatman. Readers interested in joining the Wyoming County Chorale are welcome to attend any Tuesday night rehearsal in the lower level of Nativity BVM school building off Second Street in Tunkhannock. For more information, readers may contact Pat Keiber at 570-219-4411 or Dibble at carly.dibble.wcc@gmail.com. In formation is also available at the Wyoming County Chorale Facebook page.